Emmons Preserve is another of the pocket gems around my home. Just a few acres along a stream, set aside by the Kennebunk Land Trust, with a short trail that follows the stream up and over a set of gentle falls between two pools. I go back there many times each a year. 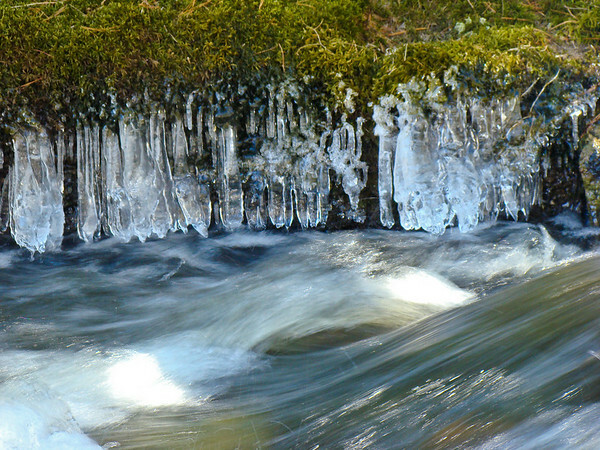 This day, the frozen spray was the subject…along the mossy banks and clinging to branches over the water. Impossible constructions that caught the winter light. I played with Program Shift on the H9 to capture a variety of images, some with the water blurred to silk like this one, and some with the water crisp and frozen in motion. Sony DSC H9 at about 270mm equiv. for framing. F7.0 @ 1/13th @ ISO 100. Programed Auto. Program shift engaged to decrease the aperture for a long exposure to blur the flowing water. From the Around Home Gallery. Just beautiful, Steve. Great capture. I love the see through colors on the icicles and all the great textures you have in the same place. You continue to do really great work !! !